I did this a month or so ago, and we LOVE it! 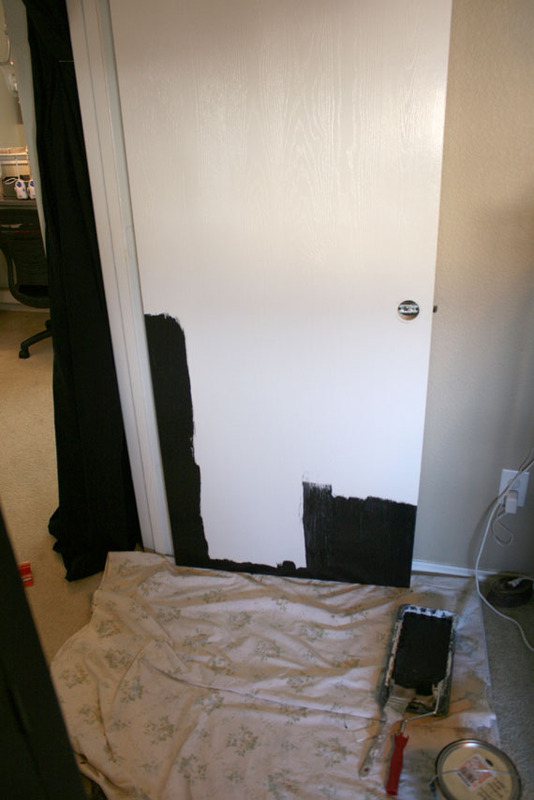 I told you back in ancient history how we had a plan to paint all the interior doors black (it all started with the front door). I bought the gallon of paint and… moved on to other things like I am good at! Ha! Well then, when I was bored one day, I had an easy ready to go project. We have a bunch more doors to paint another day too, lucky me! Projects galore! 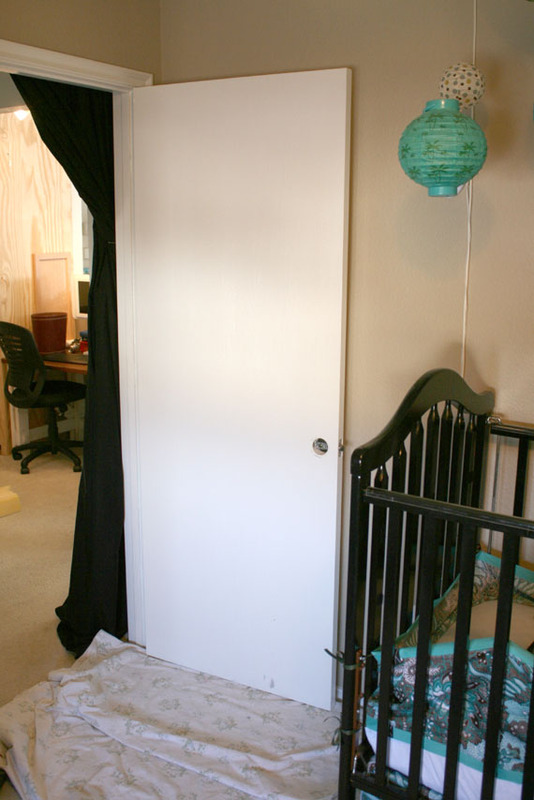 It is amazing what this project has done for our cheap ugly doors. Just your plain flat doors, with a big hideous faux wood grain (a very unfortunate feature…) But the truth is they look absolutely beautiful now. I just can’t tell you enough how much I love the look. I am not sure that I will ever paint my doors the same color as the trim again. And so here is the little hall in our upstairs before and after. I think black paint is addicting… beware! Built in Headboard! Only $4.00 dollars!! You make everything so beautiful and look so easy. Thanks an keep up the good work. I love the black doors!! I’m thinking about doing it to my doors! 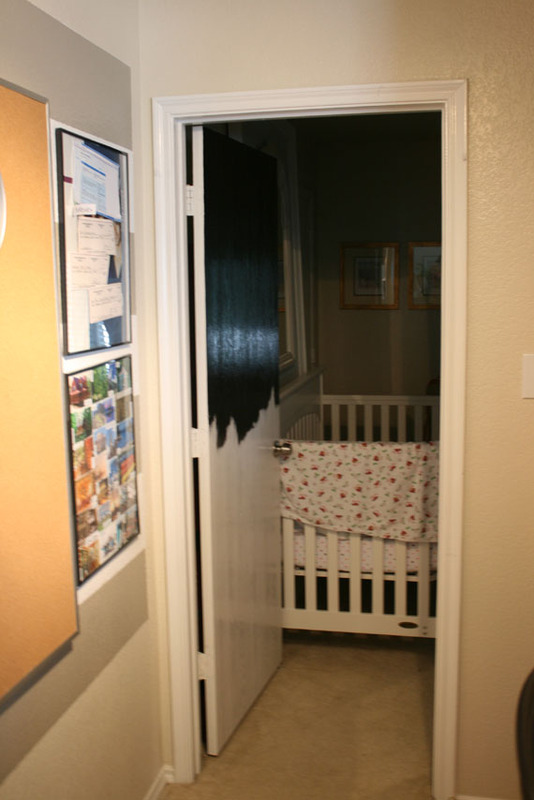 I have a question…did you paint both sides of the door black or just the side that’s pictured? If you didn’t paint both sides black, what color is the other side? What color are the edges on the side, top, and bottom? 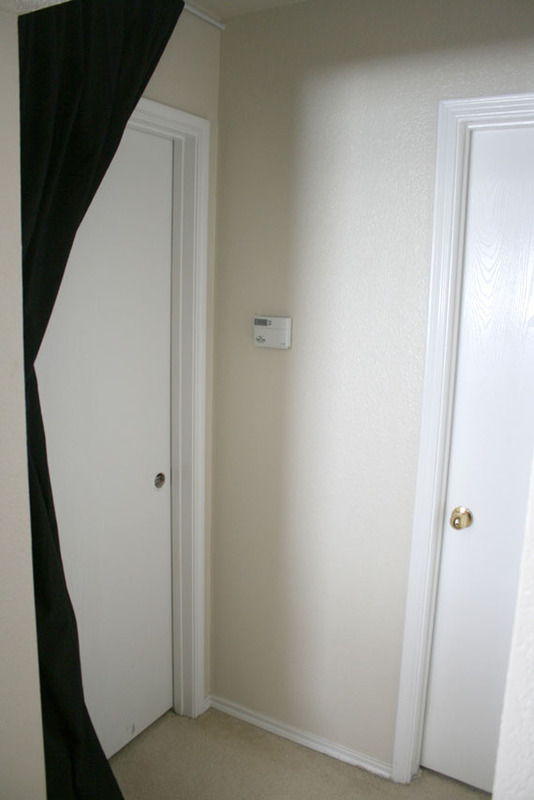 I’m trying to figure out the best way to paint the doors…sorry for all the questions!! Love your blog btw… that stair redo, wow! And the navy and pink bedroom idea, awesome!! Leah, Cassity painted all sides of the door. Everything that was visible. One more question…what paint did you use? Did you use primer or have to sand them first? Cassity used Martha Stewart semi-gloss black, called Silhouette. I hope that helps. I submitted a comment last night and its not here anymore…hopefully I did it right! If not I can write it again. Let me know! Leah, sorry, sometimes it takes us a while to go through all the comments and approve them. Thanks for commenting and visiting out blog. I want to paint my doors but I have seen paint peeling off doors that others have done themselves. What goes wrong to make that happen. Is it painting acrylic over oil or vice-versa. If that is the case how do I find out what is originally painted on my door? Also, if I am not driving you too crazy, what is the best brush to use and have you ever used a spray gun? 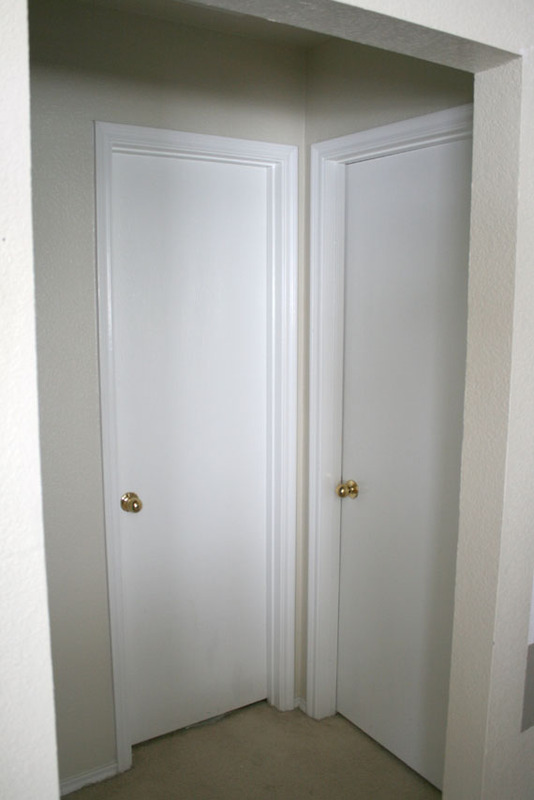 Suzanne, if the door is an exterior door, you will need to use exterior oil based paint. 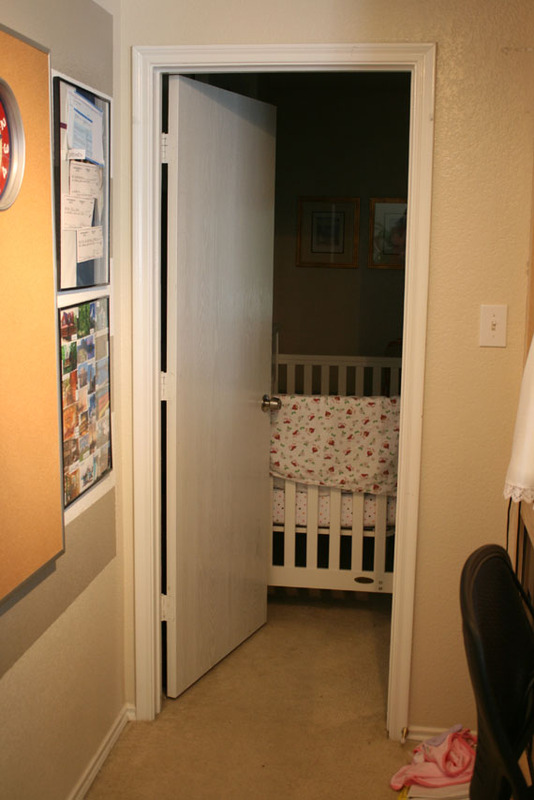 As for interior doors we have had no problems. We really like Purdy brushes, make sure not to go cheap with your brushes. We have spray painted exterior doors with spray paint and it has held up well. With spraying though, you always have to mask everything off around it, to protect against over-spray. thank you. you have convinced me to do this. i can finally agree with my husband on something 🙂 we just moved into our house and we are planning on buying a almost black stain for the doors. we are going to replace these doors because they are old and have many many many layers of paint on them (not sure if its lead or not). 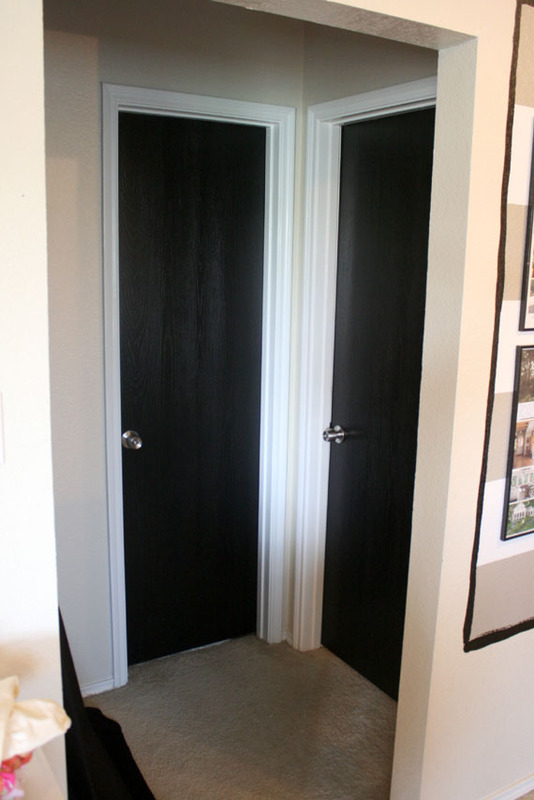 we are planning on buying plain wood slab doors and then painting them black. I do agree with not painting the trim the same color. infact we are going to go with a very bright white. Stephanie, you will love the doors, we do! I have the exact same door but I have a huge hole in mine! I was wondering if by a chance you know what’s the name of that door called. Sorry, Ishy, but I have no idea of what the name of the door is.